MM is rarely in a hurry. Most things he will take his time over. He loves to run and scoot at speed but a good tale or eating a plate of my spag bol, well that takes time. MM loves to laugh and make you laugh. The more random the better. Like when I pretend to squeeze him so tight his head pops off or pressing his nose to yours and tilting his head side to side so your eyes look like they are moving up and down. He likes to have a sneaky little pump and blame it on Daddy, even if Mr LMR has been at work for hours. MM thinks I am the funniest person he has ever met. He loves to call you names but only in jest. “Oh mammy, you silly old goat” or “smelly old poo” or “ponk a lonk a poo pants”. Recently at parent’s evening his nursery teacher disclosed that they had been concerned he wasn’t learning much. He spent all his time gazing around during the learning sessions and was difficult to engage. When tested he was hitting all of his averages. His learning style is therefore a sponge. Looks inanimate but he’s quietly soaking it all up. From dressing up to telling you a story, MM has boundless imagination. If he’s dressed up he becomes his character. After watching Pirates of the Caribbean he became Captain Jack Sparrow. If you called him by name he ignored you. Only responding to his new identity. This lasted for a few weeks until a new character emerged. 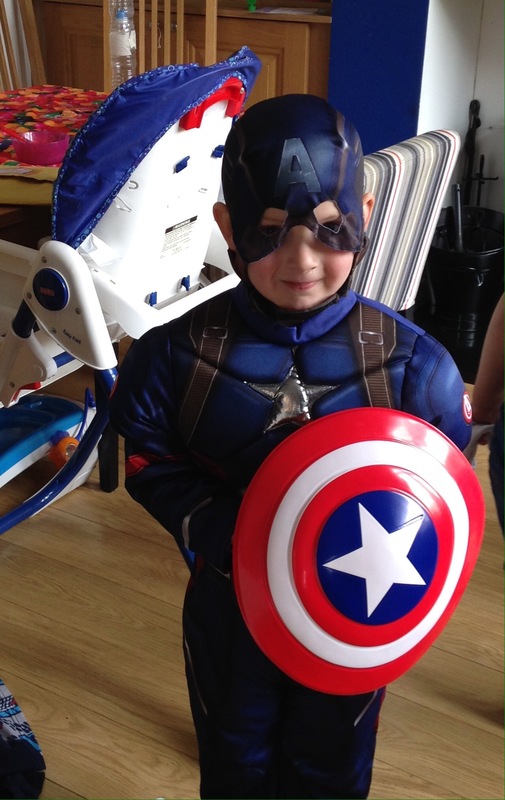 Currently he enjoys being Captain America. He is my hero. 5) Lover of Cake and all things sweet. 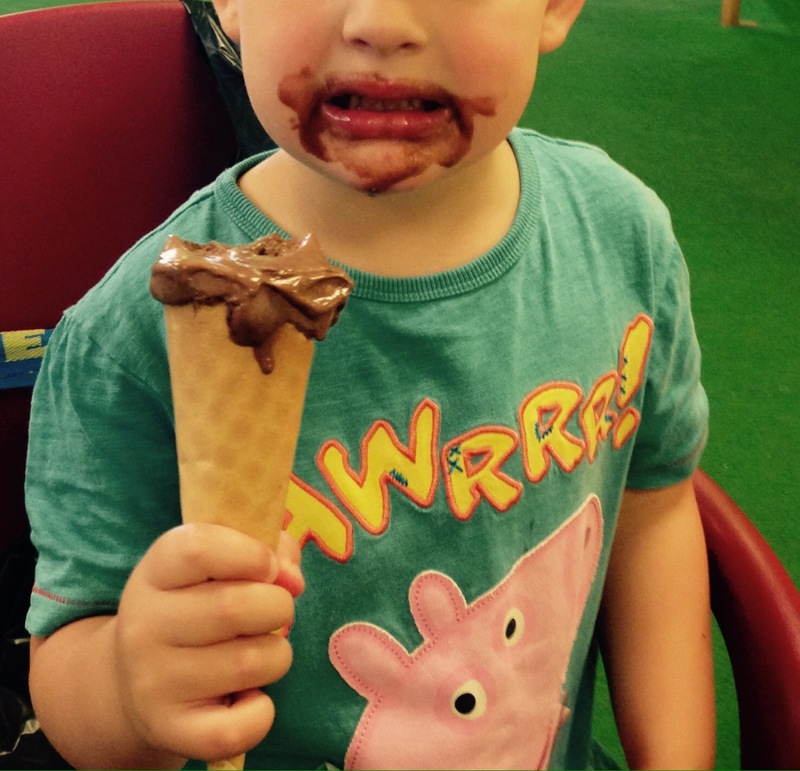 Accompanied by “mmmm” noises and a glazed expression, MM once declared “oh mummy ice cream makes me so happy”. Cake can cure most things for him. Not one to expect a pudding but should one arrive he is in heaven and most probably covered in it too. 6) No push over and always ready to say sorry. Life with MM isn’t always plain sailing. We have had our fair share of fall outs. As the younger sibling of a bossy boots there was a time when he didn’t say much. I’ll be honest, I worried that he would never use real words just a series of sounds and nonsense. But over time he began to open up and find his voice. Now you can never get him to stop. Once he found his voice, MM learned to take a stand with his older brother and became his partner in crime. If someone does something he doesn’t like, he isn’t afraid to tell you. If you push him he’ll defend himself and I’m proud of him for this. However, if he is wrong he will say sorry. Although I think this is because he knows he’ll get a cuddle. He loves a cuddle. 7) Ready to throw himself in head first. On holiday last year there was a pool at the villa we stayed in. Within the first three days MM fell in three times. One day, he just decided “I’m going to swim”. So he did. In front of our eyes he dipped his head under the water and swam off like a little fish. He still hasn’t worked out how to come up for air, but at least he can get himself to safety in an emergency. 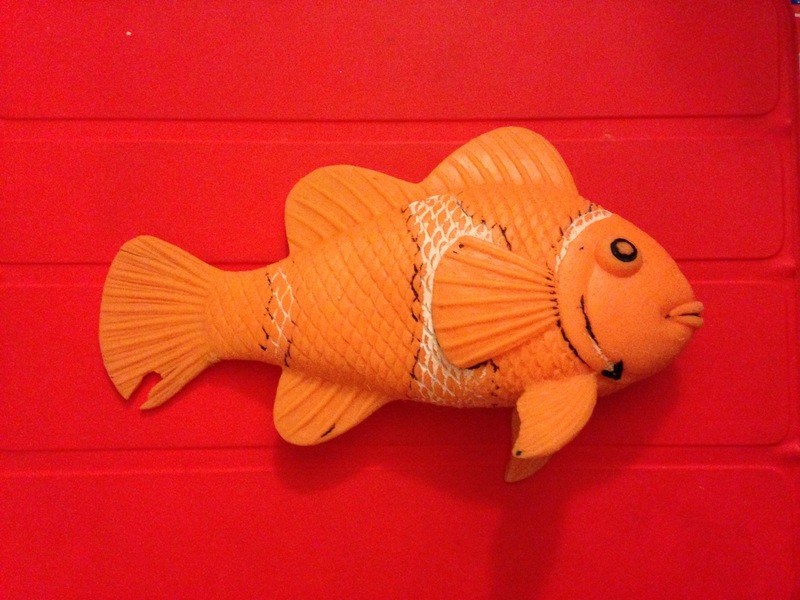 This is an orange rubber fish. It is horrible. It is one of MM’s most prized possessions. He loves it. I have nothing more to say. He has size 10 flipper feet. He runs like he should be in Monty Python. His knees stay together and his upper body stays sort of still, arms tucked in pumping like a steam train. His legs rotate from the knees down. Like a wind up bath toy. It is amazing to watch. He loves to run. 10) He made my world make sense again. From the moment MM was thrown on to my chest in the delivery suite, he changed my world around. We had such a difficult time with his brother for many reasons and MM’s arrival signified a new chapter. The face of a new little stranger to spend a lifetime getting to know. This time I wasn’t afraid. I’m not sure why. MM showed me I wasn’t a bad mum, I had just been dealt a difficult hand. He restored my confidence in my cooking, my ability to nurture a little monkey and my judgement. When he needed me to fight for him in the hospital, I did it with confidence. MM brought laughter back into my life. He built a bridge between me and his brother and softened the sharp edges. We became a whole family again because we all found common ground in this new baby. Don’t get me wrong, he brought a whole new set of problems and I still had dark days. However, he brought a new perspective and courage that I will always be grateful for. No. 10 made me well up Louise, thanks for sharing such a personal, honest and intimate part of yourself. oh and happy birthday MM, hope you all have a blast!